Looking back through my articles over the last few months, a great number have made the connection between strong, customer centric leadership and the ability to drive an effective and sustainable approach to Customer Experience. It is no secret that I am a huge admirer of Jeff Bezos, the founder of Amazon – in May I wrote an article explaining why. I followed that up a couple of weeks ago by sharing Amazon’s 14 Leadership Principles – they help to validate my admiration for the company and their CEO. Reading through the Amazon ‘path’ to leadership made me think of my own perspectives to what a customer centric leader should be doing. Whilst every human being acts and behaves differently, there are some common traits shared by those who genuinely understand, live and breathe the principles of customer centricity. 1. Talk to customers – all the time! It has always astonished me how many senior leaders within businesses have rarely met a customer. In some instances, those defining the strategic direction of organisations have NEVER met one. Meeting and talking to customers should be as commonplace to a senior leader as having lunch. Failing to truly understand how your customers feel about the experience your company delivers to them is quite simply unacceptable in the world of business today. Talking to customers should be the highlight of any leader’s week – the ability to listen and learn; empathise and question; test new ideas and theories. Talking to customers should not be seen as a chore – or something that a leader is ‘too busy to do’. A customer centric leader would not just be talking to customers – they would be ‘walking in their shoes’ on a regular basis. One of the greatest examples of this is the UK CEO of Pizza Hut. Jens Hofma has regularly worked as a waiter in one of his restaurants since taking on the top job seven years ago. Ask yourself these two questions: a) When was the last time you spoke to a customer? b) how many customers have you spoken to this year? 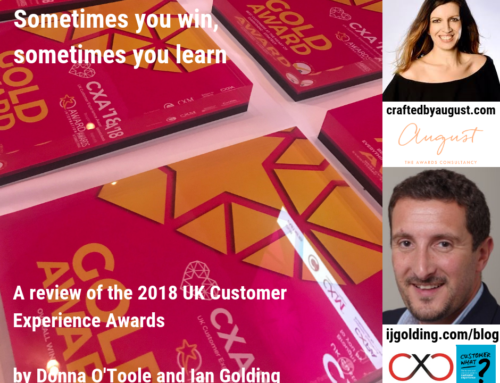 In the last five years, I have run Customer Experience workshops in over 30 countries and to representatives of over 300 companies around the world. During that time, I have had the pleasure of hosting less than 20 attendees IN TOTAL who have a seat at the top table – the C Suite as some may prefer to describe them. Often, those who have wanted to acquire knowledge, or who have been sent to do so, have represented middle management or below. In the overwhelming majority of cases, middle managers have concluded AFTER the training that their leaders need to sit through the workshop as an absolute priority! Their conclusions have been based on the realisation that their leaders do not have the required level of understanding of the principles, tools and methodologies that are required to embed a focus on Customer Experience in their organisation. Why do so few senior leaders seem to want to acquire knowledge in the subject of Customer Experience? They either know it all already or do not deem the subject important enough to warrant their attention. A truly customer centric leader understands that you NEVER stop learning. Ask yourself another question: c) When did you last acquire knowledge on the subject of Customer Experience? 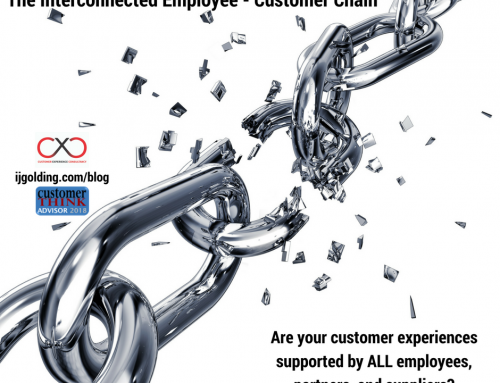 It has been well documented by me and other Customer Experience thought leaders, that one of the major barriers to achieve a sustainable focus on Customer Experience is a lack of cross functional collaboration. The inability for organisations of all shapes and sizes to break down the silos and walls that sit between different functions in their businesses is a considerable contributor to customers all around the world having ‘random experiences’ on a regular basis. Customer centric leaders are those who put the good of the organisation ahead of their own personal gain. They are leaders who recognise that it is together, as one organisation, that the Customer Experience is created and delivered – it is down to everyone working in harmony. It is so rare to see that it is almost impossible to be able to cite great examples of it. Why is it so rare? It is because to be great at cross functional collaboration requires a leader to believe in humility. Humble leaders recognise and celebrate the good things people do – even if it is not in their direct area of responsibility. If a different division comes up with a great customer centric idea, they shamelessly ‘copy’ it – giving credit to those who created it. Cross functional leaders will regularly arrange cross functional team meetings to share ideas and give feedback. They review the customer journey TOGETHER. So ask yourself another question: d) How often have you arranged cross functional meetings with colleagues from other parts of the business? Customer centric leaders are as interested and reliant on fact as any other. The difference with the customer centric leader is that the fact the seek is not restricted and limited to financial performance. Although many organisations have started to measure success based on BOTH financial performance AND customer perception, the customer centric leader ensures that everyone is rewarded on this as well. Additionally, customer centric leaders understand just how important it is to ACT on the measurement being captured. They do not see measurement as a ‘vanity project’ – they see it as a way of truly understanding how the company is performing in the eyes of the customer AND the business so they can determine what the real business priorities are. They ensure that a robust, iterative plan is in place to execute the priorities – continuously. Customer Centric leaders also understand the importance of measure the ‘Voice of the Employee’ – acting on their feedback with as much gusto and focus as that gathered from customers. Next question: e) As a leader, are you measuring AND acting on Voice of the Business, Voice of the Customer AND Voice of the Employee? Customer Experience is a long-term business strategy – a customer centric leader understands that. They recognise that success is not achieved in three months; or a year; or even two years. It is something that must be continuously focused on indefinitely — forever. The most customer centric businesses are those whose leaders remain in place for a long time – the revolving door at the ‘top table’ does not exist. This does not mean that customer centric leaders do not want to see ‘quick wins’ along the way. Quite the contrary – leaders who understand that it can take a number of years to embed a sustainable approach to Customer Experience, lead and support many initiatives along the way – to build and then maintain momentum. Transforming any organisation to be sustainably customer centric is not easy. This fact is proven by the clear majority who have failed to achieve it. That is why the customer centric leader is one who will not give up – however tough the going gets. Question time f) Have you ever ‘given up’ or halted a Customer Experience initiative? I recently had lunch in the ‘on site’ cafeteria with a large organisation. I asked the people I was lunching with if they could point out any of their senior leaders amongst the throng of people enjoying the variety of food on offer. Their answer should not have surprised me. “They don’t eat here!”, was the response. “They have their own private dining room”. Customer centric leaders would not eat in a separate room to their employees – not in the 21st Century anyway! Customer centric leaders would see lunchtime as the perfect opportunity to find time for “conversations” with staff about customers, as well as their lives in general. They would not stop there either. Customer centric leaders are constantly wanting to know how it feels to be a customer AND an employee. That puts them in a position to make better decisions – often making and sponsoring un-profitable decisions that are right for the customer and their people – decisions that are right for the business in the long term. Customer centric leaders put people at the centre of everything they do. Do you? Final question: g) When did you last have lunch and chat with your employees (not your fellow C-suite members)? A Resource for the Boss! a) When was the last time you spoke to a customer? b) how many customers have you spoken to this year? 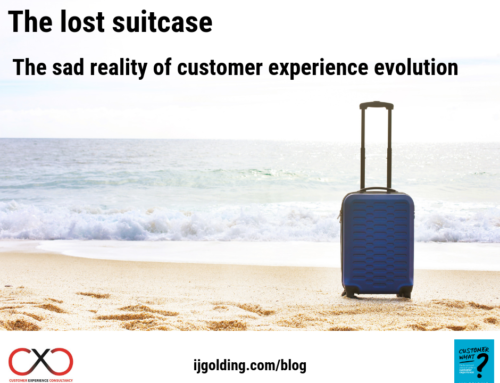 c) When did you last acquire knowledge on the subject of Customer Experience? d) How often have you arranged cross functional meetings with colleagues from other parts of the business? e) As a leader, are you measuring AND acting on Voice of the Business, Voice of the Customer AND Voice of the Employee? f) Have you ever ‘given up’ or halted a Customer Experience initiative? g) When did you last have lunch and chat with your employees (not your fellow C-suite members)? It is a good list of questions – if leaders answer them honestly, they will either validate their customer centric credentials, or highlight opportunity to develop. Really cool and relevant insight - thank you!